12/24 Volt DC Negative Logic Output, 32 Point IC693MDL750 The 12/24 volt DC Negative Logic Output module for the Series 90-30 Programmable Logic Controller provides 32 output points in four groups of eight with two common pins for each group. The Output module is designed to have negative logic characteristics in that it sinks current from the loads to the user common or negative power bus. The output device is connected between the positive power bus and the module output. The output characteristics are compatible with a wide range of user-supplied load devices, such as motor starters, solenoids, and indicators. Power to operate the field devices must be supplied by the user. Connections from the output circuits are made to the user s output devices through a 50-pin connector mounted on the front of the module. This module does not have LED indicators to indicate circuit status. This output module can be installed in any I/O slot of a 5 or 10-slot baseplate in a Series 90-30 PLC system. Table 7-21. Specifications for IC693MDL750 Rated Voltage 12/24 volts DC Output Voltage Range 12 to 24 volts DC (+20%, 15%) Outputs per Module Isolation 32 (four groups of eight outputs each) 1500 volts between field side and logic side Output Current 0.3 amps maximum per point 2 amps maximum per common at 60 C (140 F) Output Characteristics Output Voltage Drop 0.24 volts maximum Off-state Leakage 0.1 mA maximum On Response Time 2 ms maximum Off Response Time 2 ms maximum Internal Power Consumption 21 mA (all outputs on) from 5 volt bus on backplane Refer to Appendix B for product standards and general specifications. Wiring to Field Devices Direct Method This method uses cables that have a mating female connector on the module end and stripped and tinned wires on the other end. You can purchase a pre-wired cable, either catalog number IC693CBL308 (3 feet/1 meter) or catalog number IC693CBL309 (6 feet/2 meters) or, if required for your application, build your own cables. Refer to the IC693CBL308/309 data sheet in Appendix C of this manual for cable information. 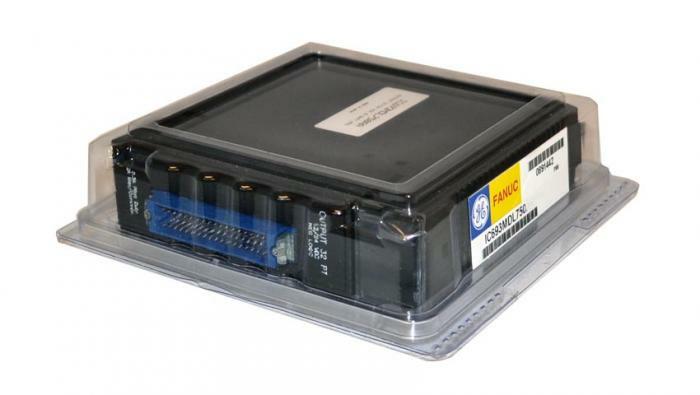 Using a Weidmuller Terminal Block You may purchase a Weidmuller #912263 terminal block from your electronics dealer to use with a GE Fanuc prewired cable. GE Fanuc Cables IC693CBL306 (3 feet/1meter) or IC693CBL307 (6 feet/2 meters) have connectors on each end. These connect from the module connector to a connector on the DIN rail mounted Weidmuller terminal block. Appendix C has a data sheet for these cables, which includes a figure showing how they connect between the module and the Weidmuller terminal block. 7 7-40 Series 90-30 PLC I/O Module Specifications July 2000 GFK-0898F Field Wiring Information The following figure provides wiring information for connecting user supplied load devices and power source to the 12/24 volt DC negative logic 32 point output module.